You have to eat and work and have a life. Here's how to get the nutrients you and your baby need. you already know that a well-balanced diet is important for good health. Now that you’re pregnant, there’s nothing more important you can do than to nourish yourself and your baby with safe and nutritious foods. But eating the right foods in the right amount can be easier said than done. How do you find time to fine-tune your diet when you’re working, squeezing in doctor’s appointments and taking weekend treks to every baby store within a 50-mile radius? And how do you cope when mysterious cravings arrive out of nowhere or you have an aversion to foods you’ve always loved? Now, more than ever before, it’s time to get serious about nutrition and solve these dilemmas. “What you eat now will set the stage for your baby’s health for decades to come,” says Elizabeth Ward, M.S., R.D., author of Pregnancy Nutrition: Good Health for You and Your Baby (John Wiley & Sons Inc., 1998). Proper prenatal nutrition is essential for your baby’s brain and physical development. “Eating the right amount of food helps promote the proper weight gain for the healthiest baby,” says Ward. (For information on weight gain and calorie needs, see “Baby-Building Basics” on page 92.) And since combining pregnancy munching with power lunching is not always easy, we’re here to help. Here’s your guide to eating in the real world, including ideas for healthful snacks; quick, delicious, nutrient-packed recipes for lunch and dinner; and advice on supplements (consult your health care provider for your specific needs). You’re busy, you’re tired, you may even be a little overwhelmed. So, when faced with a crunch like this — how to get the best for you and your baby in these precious coming months — why not do what you do best? Cook up a simple, doable plan. That’s what our “Baby-Building Basics” is designed to do. Just follow our 12 tried-and-true tips for healthful prenatal nutrition; then use our lunch, supper and snack suggestions and recipes to put them to use. You’ll never have to skip a meal, and you’ll get the valuable nutrients you and your baby need. There’s nothing quite so beautiful as a well-laid action plan, is there? 2)Use fats, oils and sweets sparingly. 3)Focus on fiber, aiming for 20 to 35 grams a day. Eating two-thirds of a cup of bran cereal, one medium cooked sweet potato and a pear puts you in range for preventing the constipation and hemorrhoids so common in pregnancy. 5)Also consider calcium supplements if you can’t make the calcium quota of at least 1,000 milligrams a day (about three glasses of milk). Some prescribed prenatal supplements won’t supply the calcium you need. 6)Help prevent birth defects by taking only prescribed multivitamins and other supplemental nutrients, such as calcium, that your health care provider recommends. Just because a little is good doesn’t mean more is better. For example, vitamin A in excess of 10,000 international units a day (twice the recommended intake) during pregnancy can cause irreversible damage such as spontaneous abortion and malformations. The safety of herbs and other botanicals during pregnancy and lactation remains to be proven, so steer clear of them. 7)Drink at least 64 ounces of fluid daily (eight 8-ounce glasses), more if you’re active and during hot weather. Fluid helps regulate body temperature, aids in digestion, works with fiber to fight constipation, and cushions joints and organs. 8)Aim for a 25- to 35-pound weight gain, as long as you began pregnancy at a normal weight. After the first trimester, expect to gain between 3/4 and 1 pound per week for the rest of the pregnancy. Twins (and more) require that you gain even more to foster a healthful birth weight. Underweight women may be advised to put on more than 35 pounds; overweight women could be counseled to put on less. Never diet during pregnancy, and always follow the advice of your doctor, certified nurse-midwife or nurse practitioner. Some women choose not to look at the scale during weigh-ins at the doctor’s office to avoid obsessing about pounds gained. 9)Add 300 calories a day to your diet, beginning in the second trimester. Women carrying more than one baby need additional calories, as do physically active moms-to-be. 10)Avoid alcohol. According to the March of Dimes, drinking even small amounts of alcohol can cause physical malformations and developmental difficulties in baby that last a lifetime. 11)Never eat raw or undercooked animal foods such as meat, sushi, seafood or eggs. Due to a somewhat depressed immune system, expectant women are more susceptible to food-borne illnesses. — Elizabeth Ward, M.S., R.D. If you like taking your lunch to work, try these simple, nutritious and delicious recipes, which were designed for night-before preparation and easy transportability. This Spanish-style frittata is traditionally eaten at room temperature and makes for a perfect brown-bag lunch. Preheat oven to 350? F. Meanwhile, in a 9-inch nonstick pan, sauté onion and bell pepper in olive oil until very soft. Add chard and water. Cover, allowing vegetables to steam until chard is soft and water has evaporated. Season with salt and pepper and add eggs. With a rubber spatula, stir mixture until the “tortilla” begins to set up. Reduce heat to low and allow to cook approximately 5 minutes; then transfer pan to oven for approximately 10 minutes. Turn onto a plate to cool; then slice into 4 wedges. Nutritional information per serving (1 wedge): 120 calories, 38 percent fat (5 grams), 23 percent carbohydrate, 39 percent protein, 51 milligrams calcium, 1 milligram iron, 23 micrograms folate, 2 grams fiber. Dressing the beans while still warm ensures that they absorb the flavors of the vinaigrette. Canned beans may be used, but they tend to be mushier and do not absorb the dressing as well. Cook the beans in salted water until tender but not soft. Drain well; then dress with olive oil and lemon juice while still warm. When cool, add scallions, tomatoes and parsley. Season with salt and pepper. Flake tuna with a fork and toss into salad. Nutritional information per serving (1/4 of recipe): 504 calories, 16 percent fat (9 grams), 57 percent carbohydrate, 27 percent protein, 225 milligrams calcium, 8 milligrams iron, 388 micrograms folate, 12 grams fiber. In this jewel box of nutrients, the vegetables can be roasted ahead of time, leaving only the couscous to be cooked. Preheat oven to 400° F. Toss vegetables with olive oil, salt and pepper; then spread out on a baking sheet. Roast for approximately 15 to 20 minutes. Remove from oven and allow to cool. Place couscous in a heat-resistant bowl with olive oil, cinnamon and salt. Stir with a fork until the couscous grains are well coated with the olive oil. Pour boiling water over couscous, making sure the grains are completely covered. Cover bowl with plastic wrap and let sit 10 minutes. Remove cover; then let cool completely. 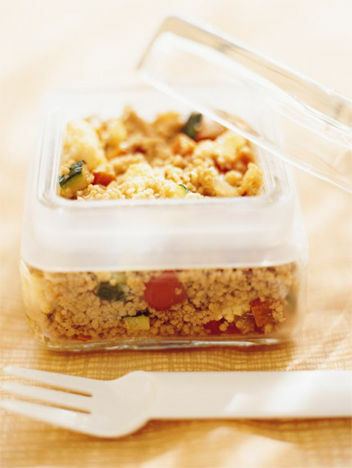 Rake couscous with two forks or rub between your fingertips to separate grains. Add roasted vegetables and garbanzo beans to couscous and dress with olive oil, vinegar and orange juice. Add cilantro and salt and pepper to taste. Nutritional information per serving (1/4 of recipe) : 490 calories, 29 percent fat (16 grams), 61 percent carbohydrate, 10 percent protein, 105 milligrams calcium, 3 milligrams iron, 135 micrograms folate, 11 grams fiber. An updated version of an old-time favorite, this salad makes a great lunch. Nutritional information per serving (1/4 of recipe): 147 calories, 3 percent fat (.5 gram), 93 percent carbohydrate, 4 percent protein, 70 milligrams calcium, .4 milligram iron, 14 micrograms folate, 4 grams fiber. Serves 4Cooking in cast iron is said to add trace amounts of iron to the nutritional content of food. Toss chicken breasts in olive oil and season with salt. Grill both sides in a very hot cast-iron skillet until no longer pink (approximately 5 minutes per side for a medium breast). Let cool and slice. Combine chicken and remaining ingredients in a bowl and toss. Nutritional information per serving (about 1/2 breast): 155 calories, 36 percent fat (6 grams), 22 percent carbohydrate, 42 percent protein, 41 milligrams calcium, 1 milligram iron, 11 micrograms folate, 2 grams fiber. These five recipes were designed for delicious dinners, but they’ll also make great leftover lunches. Serves 2Serve these tacos with a salad of jicama, orange segments and cilantro. Toss chicken breasts in olive oil and season with salt. Grill both sides in a very hot cast-iron skillet until no longer pink (about 5 minutes per side for a medium breast); slice. Heat black beans and season to taste with green chili salsa and salt. Heat tortillas and fill with chicken, black beans, cabbage and tomato salsa. Nutritional information per serving (2 tacos): 504 calories, 18 percent fat (10 grams), 49 percent carbohydrate, 33 percent protein, 179 milligrams calcium, 5.3 milligrams iron, 400 micrograms folate, 15 grams fiber. Serves 4Steaming the eggplant produces tender, creamy results while preventing it from soaking up too much oil. Steam eggplant until tender. Simmer marinara over medium heat for about 5 minutes; add eggplant and simmer another 5 minutes. Season with salt and pepper. Combine sauce, basil, cooked pasta and reserved cooking water in a large bowl. Dot with ricotta and freshly grated Parmesan cheese. Nutritional information per serving (1/4 of recipe): 334 calories, 13 percent fat (5 grams), 68 percent carbohydrate, 19 percent protein, 216 milligrams calcium, 3.6 milligrams iron, 28 micrograms folate, 5 grams fiber. Serves 2This is a quick, easy way to cook salmon. The sauce is low in fat and high in calcium. Preheat oven to 500° F. Meanwhile, brush salmon and asparagus with olive oil. Season with salt and pepper. Roast on sheet pan for 10 minutes. Serve drizzled with yogurt, grain mustard and caper sauce. Nutritional information per serving (1 salmon fillet): 325 calories, 30 percent fat (11 grams), 13 percent carbohydrate, 57 percent protein, 154 milligrams calcium, 2.8 milligrams iron, 285 micrograms folate, 2.5 grams fiber. Serves 4This colorful, comforting dish contains a wealth of fiber, vitamins and the all-important folate. Preheat oven to 450° F. Combine all ingredients except the greens and roast for approximately 25 minutes or until tender and slightly browned. Toss in a large pan with greens and sauté until greens are just wilted. Nutritional information per serving (1/4 of recipe): 226 calories, 28 percent fat (7 grams), 64 percent carbohydrate, 8 percent protein, 234 milligrams calcium, 2.5 milligrams iron, 185 micrograms folate, 7.5 grams fiber. Serves 4This quick meal is made easy with the help of a high-quality pre-made crust. Preheat oven to 450° F. Heat olive oil and sauté onion and bell pepper until both are softened and the onion has begun to brown. Add lemon zest and season with salt and pepper. Remove from heat, add torn spinach, toss until wilted and spread over pizza crust. Sprinkle with Pecorino Romano cheese, then mozzarella. Bake on a sheet pan on the top rack of the oven for 8 to 10 minutes. Nutritional information per serving (1/4 of recipe): 432 calories, 31 percent fat (15 grams), 50 percent carbohydrate, 19 percent protein, 400 milligrams calcium, 1.5 milligrams iron, 210 micrograms folate, 4 grams fiber. To make your pregnancy eating even easier, here’s a complete list of the nutrients you need every day and where to get them. Meat, oysters, poultry, legumes, wheat germ, whole grains — E.W.